I posted just a couple of weeks ago about ways to keep track of journal tables of contents online. I quickly got a very helpful comment from Roddy McLeod directing me to JournalTOCs, a resource similar to TicTOCs. It lists 108 journals under Classical Studies, and 65 under Archaeology. It also has an API, for you programmers out there. I also, as a followup to my post about academia.edu, discovered that one can “follow” journals at that site, and in so doing, get links to newly published articles at the journal’s home page. There are browseable lists of journals for specific disciplines, though they aren’t easy to find from the basic journals page. Here are journals in Archaeology (91), Classical Archaeology (29) and Classics (10) – note there is overlap. 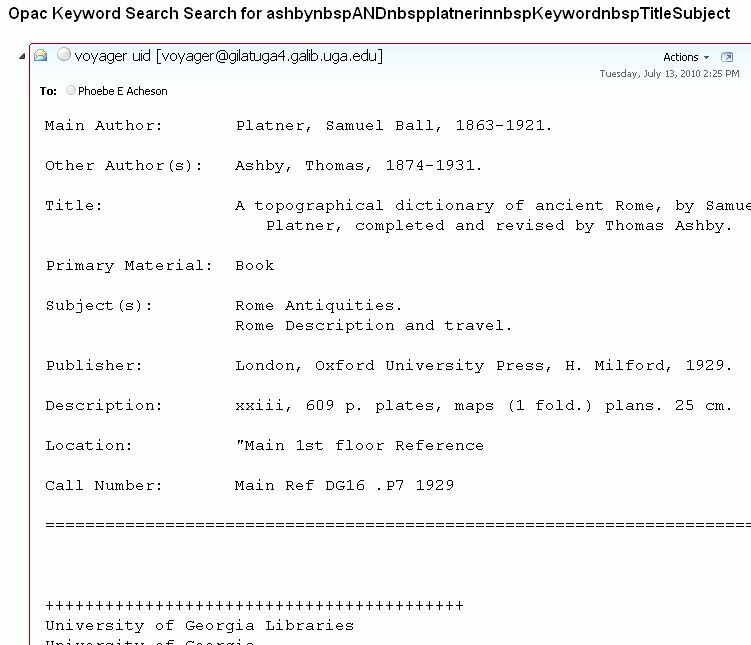 The journal following interface allows searching by keyword (including truncated keywords, like “librar” for library, librarian, etc.) as well as presenting journals in alphabetical order by title. Another way to find journals of interest, especially if your research does not fall neatly into one discipline, is to look for a scholar who shares your research interests and see what journals she is following. I just received an email from Bryn Mawr (my alma mater) telling me that Miss Lang died on Wednesday, at 92. Professor Lang was raised in Hamilton, New York. She earned her AB from Cornell (1939) and her MA (1940) and PhD (1943) from Bryn Mawr College. She commenced teaching at Bryn Mawr in 1943 and served on the faculty of the Greek Department for 45 years, before retiring in 1988. Miss Lang, as she was known to many, began her service to Bryn Mawr as Warden of Rockefeller Hall (1942-1945). She served the College in a number of administrative capacities: Acting Dean of the College, Dean of the Sophomore Class, and Secretary of the Faculty (1970-1975). In 1961, she became Chair of the Department of Greek and held the position, without sabbatical, until her retirement 27 years later. A revered and formidable presence on campus, Professor Lang was an inspiring, caring and demanding teacher. Professor Lang taught her signature undergraduate course – “Baby” Greek – almost every year, introducing nearly a thousand students to the language. Her graduate seminars on Homer and Thucydides set a standard across her academic field. On a less academic note, Professor Lang was the beloved stage manager of a number of Bryn Mawr College Faculty Shows including: Standing Room Only (1943), Top Secret (1947), Kind Hearts and Martinets (1951), and The Profs in the Pudding (1955). Professor Lang was a prolific and celebrated scholar, who wrote twelve books and more than fifty articles, spanning the fields of history, epigraphy, and archaeology. As a Fellow of the American School of Classical Studies at Athens, she excavated at the Acropolis and the Agora; this led to the publication of the first guide to the Agora, four Agora picture books, and three scholarly volumes in the esteemed Agora series. In the 1950s and 1960s, she participated in excavations at Gordion (Turkey) and the Palace of Nestor at Pylos (Greece) that led to numerous publications. Particularly seminal were her reconstruction of the frescoes at Pylos and her interpretation of tablet fragments in Linear B (the script of the Mycenaeans). Professor Lang’s later scholarship on Herodotus, Homer, and Thucydides was equally impressive and well-received. Professor Lang’s academic contributions were widely recognized. She was awarded the Blegen Research lectureship at Vassar College (1976) and chosen to deliver the Martin Classical Lectures at Oberlin College (1982). Honors included a Guggenheim Fellowship, a Fulbright Fellowship to Greece, three honorary degrees, and membership in the American Philosophical Society, the American Academy of Arts and Sciences, the German Archeological Institute, Phi Beta Kappa, and Phi Kappa Phi. Details about memorial services will be forthcoming. There’s no post on the BMC website yet, so nothing to link to, but I expect there will be soon (Edit: yup. Same content as above). Wikipedia has a short list of some of her publications, with links to those available online (mostly the Agora-related pamphlets). I got a mysterious email from GIL (UGA’s online library catalog) this past week. Someone sent me the catalog record for Platner and Ashby’s Topographical Dictionary of Ancient Rome. The mystery part is, there was no note or accompanying email from anyone I know explaining that they’d sent it to me because… Possibly the catalog is developing HAL-like tendencies and wants to tell me something. I’m choosing to take it as a sign from the universe that I should do a blog post about resources for the topography of Rome. I originally put these together for a page of resources for the UGA Study Abroad summer program in Rome. A big part of the curriculum is the topography of Rome class, and there are now many wonderful digital resources available on this topic. Google Earth Ancient Rome 3D Requires the download of Google Earth; Rome is presented is 320 C.E. Rome Reborn (UVA) This academic consortial project began in 1997 and furnished the models for the Google Earth Ancient Rome layer; their goal is to model the city from ca. 1000 B.C.E. to 550 C.E. Aquae Urbis Romae (UVA) A cartographic exploration of the relationship between Rome’s water supply and urban development; currently explores 750 B.C.E to 1700 C.E. Digital Roman Forum (UCLA) Displays images of the buildings in the Forum on June 21, 400 C.E. Interactive Nolli Map (Oregon) Exploration of various aspects of Giambattista Noli’s 1748 map of Rome, with maps and essays. Digital Forma Urbis Romae (Stanford) The 1186 fragments of the Severan Marble Plan of Rome (ca. 203-211 C.E. ), with essays and bibliography. Lacus Curtius (Chicago) Includes a gazetteer of Rome (Topographia Urbis Romae) and the full text of Platner and Ashby’s Topographical Dictionary of Ancient Rome. Not Rome, but Roman, and very cool: Google Street View now includes Pompeii! Many scholarly journals now make their tables of contents available digitally upon publication of a new issue, by email and/or RSS (collect RSS feeds using Google Reader or Bloglines). Some classics journals now provide this service. There is a site which collects such feeds, called ticTOCs. It currently has feeds for 16 journals categorized as Classical Studies (Acta Antiqua, Ancient Civilizations from Scythia to Siberia, Ancient Society, Antik Tanulmányok, Classical Antiquity, Classical Philology, The Classical Quarterly, The Classical Review, Forschung im Ingenieurwesen, Hermes, Hesperia, Historia, History of Political Thought, Journal for the Study of Judaism, Kadmos, Mnemosyne); depending on your research interests you may also want to search for other subjects. Archaeology as a subject search turns up 56 titles, for example (including Anatolica, Ancient Near Eastern Studies, Ancient Society, Archaeometry, Cambridge Archaeological Journal, Journal of Mediterranean Archaeology, Journal of Near Eastern Studies, Karthago, Oxford Journal of Archaeology, Praehistorische Zeitschrift), Literature has 143, and various subclasses of History include over 200 titles. There’s a short guide to using ticTOCs written by the Cornell Libraries for those who need help getting started. In many of these cases, you can also go directly to the digital home of the journal (Google the title) and look for an RSS button (they are usually orange and squarish, see below) or link for a table of contents alert. You are currently browsing the Becoming a Classics Librarian blog archives for July, 2010.